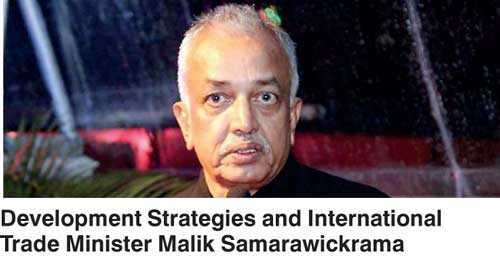 Development Strategies and International Trade Minister Malik Samarawickrama has issued another statement on the Free Trade Agreement between Sri Lanka and Singapore, dispelling allegations made against the manner in which the agreement was drafted and its effects. The following is the full statement. My attention is drawn to serious allegations being made in various fora, orchestrated by opposition politicians including certain segments of professionals, on the Sri Lanka-Singapore Free Trade Agreement (SLSFTA) already executed and in force since 1st May, 2018. The statements made alleging that that the Agreement was developed secretly, without the knowledge or approval of the Cabinet, and that the Agreement is severely detrimental to local industry is absolutely incorrect and is a fabricated lie to mislead the public. The SLSFTA is an integral part of this government’s economic growth strategy and was developed in line with the National Trade Policy developed through a team of experts under the aegis of this Ministry, through a wide stakeholder consultation process. The National Trade Policy was duly adopted by the Cabinet of Ministers in August 2017. The SLSFTA so developed encompasses, inter alia, facilitation of trade, removal of trade and tariff barriers and other impediments including in logistics, liberalization of investment regime, and systematic approach in attracting foreign direct investment (FDI), while improving Sri Lanka’s competitiveness and growth in exports. It is alleged that this Ministry has engaged in the SLSFTA, without a proper mandate, not followed the correct process and has executed the Agreement by misleading the Cabinet of Ministers and even H.E. the President. Serious accusations are also being levelled against the officials of this Ministry and the negotiating team, who had done a commendable job in completing this important bi-lateral Trade Agreement, under difficult circumstances, keeping to the government policy and with its due concurrence and mandate. As the Cabinet Minister in-charge, I reiterate with responsibility that the SLSFTA was developed through a wide stakeholder consultative process, pursuant to top-level G to G commitments, wherein business and trade chambers, trade associations, relevant public departments, and entities and professional bodies were engaged. The process was initiated with a Scoping Meeting held in July 2016, and since then eight rounds of negotiations were held between the respective negotiation teams. Over the elapsed time of 18 months, over 20 consultations were held with a wide range of stakeholders. The scope and extent of tariff liberalisation included in the SLSFTA was done on the basis of overall consensus arrived through such consultations and with due cognisance on the possible implications to the government revenue, which will be minimal within the agreed Trade Liberalisation Program. The argument that the tariff reductions in the SLSFTA will have an adverse impact on government revenue is therefore baseless. On the contrary, it will support reducing the cost of inputs to local manufacturers, improve their competitiveness and benefit local consumers. There has been no liberalization of services under Mode 4, and there will be no liberalization of professional services. The services liberalisation encompassed in the SLSFTA is limited to Mode 3 only, and that too on selected sectors that enables attraction of FDI with least impact to Sri Lanka. I am confident that inclusion of such liberalisation will create more opportunities for our professionals and enable them to be on par with global standards. Our government believes in the ability of our professionals and entrepreneurs to be competitive and become active players in the global value chains. The Cabinet of Ministers were duly updated through an Interim Report submitted in August 2017 on the progress, on the areas and extent of liberalization, including the status of consultative process carried out with the stakeholders. The first Draft of the SLSFTA was submitted to the Cabinet in December 2017 which was taken up for discussion on 9 January 2018. Observations on the Draft Agreement were submitted by H.E. the President and 14 other Cabinet Ministers; all positive, including two ex-Cabinet Ministers now sitting in the Opposition. The Cabinet, having considered all aspects, directed the Ministry to address the pertinent observations made and to finalise the Agreement after obtaining the approval of the Attorney General. In conformity with the directives of the Cabinet, the Amended Draft Agreement with the approval of the Attorney General was re-submitted to the Cabinet for approval for signing. Approval for entering into this Agreement by the Minister of Development Strategies and International Trade was given on 16 January 2018 and the Agreement was entered into on 23 January 2018. The above facts documented will bear the truth of the matters and will clear any doubts in the minds of the public created by some ex-cabinet ministers, now sitting in the opposition that there was no deep deliberation on this important Agreement in the Cabinet, misrepresenting facts and attempting to mislead the public. It is important to highlight that parallel to this process, the Government is also actively engaged in reviewing the existing ecosystem in doing business in Sri Lanka with a view to facilitate local entrepreneurship through the implementation of the Ease of Doing Business, National Export Strategy, and the Export Market Access program. In addition, the Anti-Dumping and Countervailing Duties Act and Safeguard Measures Act have already been enacted under the Chapter on Trade Remedies thereby barring any misuse of the SLSFTA, or for that matter any other imports from any source to the country, thus ensuring protection to both local industries and the consumer. Finally, a trade adjustment package will be put in place to assist local industry to become internationally competitive. Local industry will be better positioned to attract FDI together with technical expertise, and to establish Sri Lanka’s active participation in the Global Value Chain/Networks. The SLSFTA is a phenomenal step towards enhancing market access and trade potential, thus, integrating us into the global economy which is opportune, and much needed for Sri Lanka’s economic growth. The ex-cabinet colleague, and Kurunegala District Parliamentarian Hon. Dayasiri Jayasekara, who was privy to the proceedings at the Cabinet, is making a dubious attempt to discredit the progressive work that we have done by saying that ex- Central Bank Governor Arjuna Mahendran was playing a key role in the SLSFTA – this is a diabolical lie and shows the bankruptcy of this politician; Mr. Mahendaran had no involvement whatsoever in the SLSFTA. While refuting and rejecting the wild allegations, accusations and overtly misleading statements made by some politicians and few segments of so-called professionals, with vested political interest, which are factually incorrect, I state with responsibility that we have and will always, work with utmost integrity, professionalism, keeping the countries’ best interest at heart. The SLSFTA has given the right signal to the world that Sri Lanka is ready for business and on the right path for rapid economic transformation for the greater benefit of the public. As a responsible ministry, we are ready to clarify and clear any doubts of anyone, in understanding and interpreting the various terms and covenants in the SLSFTA, that is published on the ministry website – www.modsit@gov.lk, and/or any specific concerns. All such queries can be directed to secretary@modsit.gov.lk.